Swarovski crystal fanatics and Ugg fanatics, get ready for your Swarovski Limited Edition Ugg Boots! These are Ugg boots, embellished with Swarovski crystals for several major markets. The Ugg boot decorations celebrate some famous cities/regions (most of which are in the USA): London, Miami, Los Angeles, Las Vegas, New York City, and Washington DC. According to the articles I read, the limited edition Swarovski emblazoned boots retail in the $800 – $900 price range! And the boots are only available in Ugg stores of the celebrated cities. The New York City grey boots commemorate the New York skyline with the Empire State building in Swarovski stones. The United Kingdom version shows a crown in Swarovski crystals. There is a Union Jack version as well for the United Kingdom, that appears to be decorated with clear and red Swarovski crystal stones. The Miami, Florida Ugg boots are white, decorated with numerous colors. Pink flamingos and palm trees are obvious icons for these boots. The Los Angeles, California Ugg boots are black. The design appears to focus on the nightlife of the city and nearby Hollywood, featuring red and clear Swarovski stones. 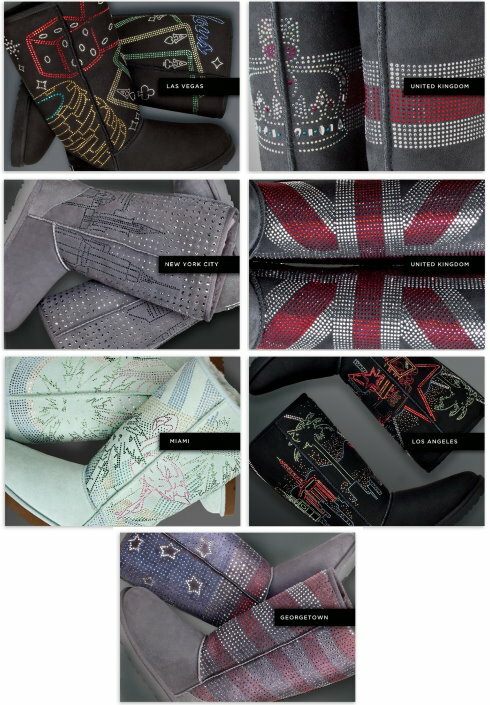 The Washington DC / Georgetown Ugg boots are naturally decorated with traditional red, white, and blue Swarovski stones, with our grand flag design….stars and stripes forever. The flag is on a grey-colored Ugg boot. The Las Vegas, Nevada Ugg boots appear to be dark brown and symbolic of the gambling in the city. Aces, poker chips, and dice are incorporated into this city design. One site I read indicated that there were 100 pairs created for each city, and that each pair was numbered to ensure authenticity. I supposed that makes them Swarovski NLE! I did not find any mention of the release date. There is a theory that the team effort between Ugg and Swarovski will extend to other cities, as if these cities are test-market areas. I like my Ugg boots and slippers….very comfy. However, I cannot see myself spending a small fortune on footwear embellished with crystal unless I plan to display them right next to my other Limited Edition Swarovski figurines in the cabinet! Swarovski stores are actively contacting their SCS customers about placing an order for the Swarvoski NLE 2011 – the Swarovski Bald Eagle. A store in Ohio has added the Swarovski Bald Eagle to their web site Limited Edition Bald Eagle. From what we have heard, an SCS member may purchase more than one Swarovski Bald Eagle. We’ve also heard that about 1/3 of the 10,000 Bald Eagles are allocated to SCS members in the USA. Coming from our customers, a number of Swarovski members have already declined to purchase as they prefer a clear crystal limited edition figurine. So if you are highly interested to add the Swarovski Crystal Bald Eagle to your collection, you may wish to contact your favorite retailer real soon, ready with your SCS valid membership number, so that your order can be placed for the crystal figurine. As Swarovski has done in the past with other NLE, after a short period of time, the Swarovski Bald Eagles will be offered online to non-SCS members. The Swarovski Centrotavola Centerpiece is a rare and unique sculpture that was in the Daniel Swarovski product line. So you are wondering just how rare it is? Swarovski produced only 250 of them from 1989 to 1997. The Centrotavola bowl is a Swarovski NLE. Each of the Centrotavola centerpiece bowls had a numbered certificate (matches the number engraved on the bowl) accompanying the rare figurine. The original MSRP of the figurine was $5275. The Swarovski artist credited with the design is Ettore Sottsass. 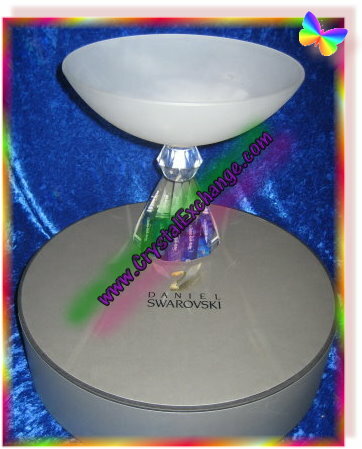 The Swarovski part number is 9980 000 005. The Swarovski system number is 155 459. This magnificent centerpiece measures 10″ in diameter. There are surprising factors in the sale…the length of time listed and the final selling price. I’d like to think that a Swarovski limited edition figurine of 250 units would definitely hold the original retail price. And that a Swarovski limited edition figurine of 250 units would have a faster turnaround with respect to how quickly it sells after it is listed on the web site. 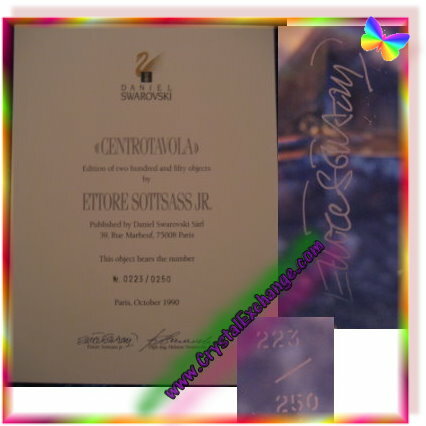 This rare Swarovski crystal Centrotavola was listed on the Crystal Exchange America web site (http://www.crystalexchange.com/) nearly 2 ½ years prior to selling. Not only that, the list price when it sold was about 33% LESS than the original MSRP. The Centrotavola bowl was in MINT condition with all original packaging, so condition, certificate, and box did not play a part in the final price. So what does this mean to Swarovski fanatics? I believe there are a lot of factors that contribute to whether or not retired Swarovski sells quickly and the final selling price of the figurines. In this case, I think the biggest factors are the economy and the overall appeal to the collector. 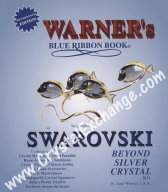 The economy is still weaker, contributing to the overall trading prices on ALL retired Swarovski collectibles. Since our beautiful Swarovski crystal is not a necessity, people and collectors are spending less money from their expendable budget on it. While the Centrotavola is certainly a magnificent Swarovski figurine, I think that many collectors still prefer animal-type figurines and sculptures. My company, Crystal Exchange America, has a much higher turnover rate on animals or cute figurines, than on functional items, like candleholders, bowls, or more artsy-type productions from Swarovski. My strong recommendation is to purchase the Swarovski crystal figurines that a collector personally likes and will get enjoyment out of displaying. I used to purchase more Swarovski than I do now….mostly due to the economy and limitations on my budget. So, it is more important than ever for me to pick my favorite Swarovski figurines when I make that decision to purchase. Swarovski fanatics will be excited about the upcoming release of the new colorful Swarovski Paradise figurines. From the four items that will be available in March, I like the Swarovski French Angelfish the best. This new group of Swarovski Paradise figurines reminds me of the Swarovski ‘South Sea’ theme group.There is a slide show with attractive pictures of the new Swarovski Paradise figurines on the official Swarovski web site. If your Swarovski collection is missing a retired Swarovski Paradise figurine, Crystal Exchange America has a large selection available. I’m going to cover some more acronyms used in advertising crystal that is for sale primarily in the online auctions. While the many seasoned Swarovski Crystal collectors understand the acronyms, there are still a lot of people buying and selling Swarovski who truly do not understand the commodity at hand. So, I thought I’d do my best to explain the acronyms and offer cautions on the use of them. Swarovski AE Siku – 2011. In many cases, Swarovski SCS figurines are Swarovski AE figurines. However, Swarovski AE figurines are not necessarily Swarovski SCS figurines. One thing for certain to keep in mind is that Swarovski SCS figurines definitely have special Swarovski Certificates. Swarovski AE figurines may or may not have a special certificate. 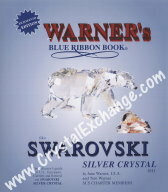 Be careful if you see contradictory information (for example an auction for a Swarovski AE states Swarovski Certificate included, but shows an image of the generic product booklet). Locating and purchasing a special AE certificate can be difficult and expensive (yes, expensive for a few page pamplet). When the transaction is completed the buyer needs to be satisfied with the merchandise being offered and final winning bid. Swarovski fanatics will be excited about the upcoming release of the new Swarovski Jade, the Lovlots 2011 Limited Edition! Swarovski Jade is a Dancing Horse, part of the new Swarovski Lovlots Circus series. 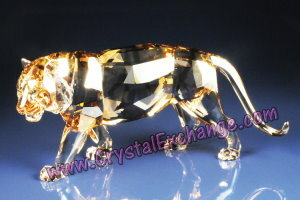 Swarovski Jade is a limited edition crystal figurine available only in 2011. A cute photo of Swarovski Jade and more information regarding launch date (March 7, 2011) is available at the Swarovski web site. Other Swarovski Lovlots Circus crystal figures that go with Jade, the Swarovski dancing horse, are: Swarovski Benny Bunny, Swarovski Jasmine Dancing Horse, Swarovski Leo Lion, Swarovski Rolly Monkey, Swarovski Rosalie Dancing Horse, Swarovski Toby Elephant, and Swarovski Tony Elephant. Pictures of eight Swarovski Lovlots Circus figurines can be found at the Swarovski web site. The site also states that they should be available in the online shop for purchase in March of 2011. There is no mention of the price on any of them. The Swarovski Lovlots Circus is the 4th series of adorable Lovlots figurines. The other Swarovski Lovlots are series include: Swarovski City Park, Swarovski House of Cats, and Swarovski Gang of Dogs. Another “unofficial series” are the Lovlots Pioneers which are initial group of Lovlots figurines. Other special limited edition Swarovski Lovlots include: Shady (Swarovski LE 2006), Pinky Mo (Swarovski LE 2007), Swarovski Soccer Mo (Swarovski LE 2008), Swarovski Flower Mo (Swarovski LE 2009), Swarovski Halloween Mo (Swarovski LE 2009), Swarovski Country Mos (Swarovski LE 2010), Swarovski Glamour Mos (Swarovski LE 2010), and Swarovski Charming Mo (Swarovski LE 2011). 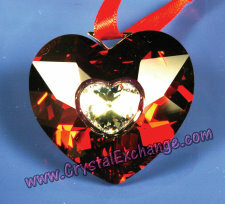 The limited edition year in engraved on the bottom of these Swarovski Lovlots crystal issues. If your Swarovski collection is missing a retired Swarovski Lovlots figurine, Crystal Exchange America has a large selection available. They have figurines from all four series in addition to the special limited edition Lovlots. Within the past few days, one of our clients has received a number of phone calls from Swarovski retailers about placing his order for the Swarovski 2011 Numbered Limited Edition, the Swarovski Bald Eagle 2011. The Swarovski 2011 NLE retails for nearly $4000. 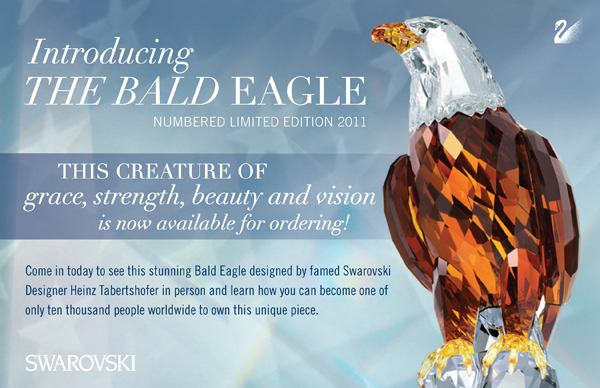 Maximum production for the Swarovski NLE Bald Eagle is 10,000. The 2011 NLE Swarovski Bald Eagle will come in a blue suitcase with a Swarovski Certificate of Authenticity and gloves. 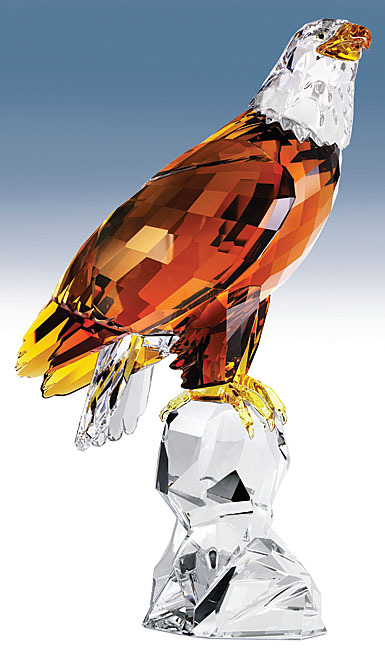 The Swarovski NLE Bald Eagle uses colored crystal components. The 2011 Swarovski Bald Eagle is sold on a first come, first serve basis. Swarovski Designer for the Swarovski 2011 Bald Eagle is Heinz Tabertshofer. Other Swarovski Numbered Limited Editions include: Swarovski NLE Eagle – 1995, Swarovski NLE Peacock – 1998, Swarovski NLE Wild Horses – 2001, Swarovski NLE Elephant – 2004, Swarovski NLE Bull – 2006, and Swarovski NLE Rhinoceros – 2008. So if you are highly interested to add the Swarovski Crystal Bald Eagle to your collection, you may wish to contact your favorite retailer, ready with your valid SCS membership number, so that they can get your order in for this crystal figurine. As the company has done in the past with other NLE, after a short period of time, they will begin offering it to non-SCS members.